Soprano Clara Sandler is a graduate of the New England Conservatory of Music, where she is a member of the Voice faculty and co-chair of the Preparatory School's Voice department. 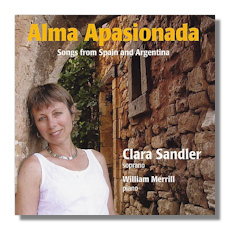 Born in Buenos Aires, with a repertoire ranging from Bach to Gorecki, Sandler recorded this collection of a dozen and a half romantic songs by four Spanish-speaking composers from the early twentieth century as a way to "connect with her roots", which are also Jewish. This independently-produced CD with piano accompanist, William Merrill, was recorded at the New England Conservatory's Jordan Hall in June and September 2004. It features music by four composers steeped in the color and heat of Spain and Argentina. Manuel de Falla is represented by four early songs, some with folk influences; all highly polished. Sandler brings to these a flair and engagement that ooze commitment and a deep understanding of the idiom and the tone which the composer struck. These songs come from early in de Falla's life, between 1899 and 1915, long before he moved to Argentina. Rodrigo, who also met de Falla, wrote his "Cuatro Canciones Sefaradies" after the Spanish civil war in the spirit of intense nationalism. The words were adapted from anonymous sources by Rodrigo's Turkish pianist wife, Victoria Kamhi. These songs have much of the dynamism of the better known orchestral works by the composer. Buchardo is less well known. He was the predominant figure in Argentinean music (both as composer and entrepreneur). His music, too, reflects the folk heritage of twentieth century South America. There is a simplicity in his style, a directness and clarity to which Sandler responds very well. If unknown to you, these works make a striking short introduction to this field. Halffter, too, moved from Spain to Central America. Influenced by de Falla as so many were, the composer was founder of "Los Ocho" (The Eight) in Madrid and played a major part in Mexico's musical life while in self-imposed exile there after the Spanish civil war. His aim at purity is nicely reflected in Sandler's vocal tone. Given the history and nationalistic push which inform this music, Sandler has done well to balance what could be a cloying or somewhat steamy atmosphere with the subject matter of the songs themselves. They are often down to earth ("Cool shade from the willows", "Holding Hands") and range from lullabies to longing for a life at sea. It's important that the sound of the voice is contained and controlled, and does not reach too far. That detracts from the subject matter. It's equally important to concentrate on the words and their settings. In this Sandler has by and large succeeded with her larger than life vocal presence. If new to the music you really can take it at face value and enjoy it for the humanity by which it is inspired. Not everyone will respond to Sandler's pronounced vibrato. It's a worry that her production may not communicate just what she wanted, however close in temperament the effort is to the florid world of the repertoire. That's very much in the spirit of the enterprise. To quote Sandler's notes: "So let yourself be enveloped by these beautiful sounds: the sensual passion of the music from Spain; the nostalgic flavor of the songs from Argentina; the mesmerizing Sephardi songs… Enjoy!" The booklet (which has de Falla's birth in 1878, not 1876) has the texts in Spanish and English. This is a personal celebration of highly charged and intense songs. Sandler's take on their warmth, their intensity and simple communicative powers (this is a very intimate recital, despite a roomy acoustic) could well be what some listeners are looking for. It is also to the credit of those involved in this recording that variety has been achieved. And a sequence that captures nicely the spirit of the songs. Although they formed no part of any "movement" as such, Sandler brackets them with a purity of tone. Hers is a rich voice with an expressive diction; these serve both to allow us to hear them clearly and to let their charm work on us as it will.